Maple syrup is usually made from xylem sap. Sugar maples, black maples, and red maples are the most common trees that produce this sap, but any maple species can be used. 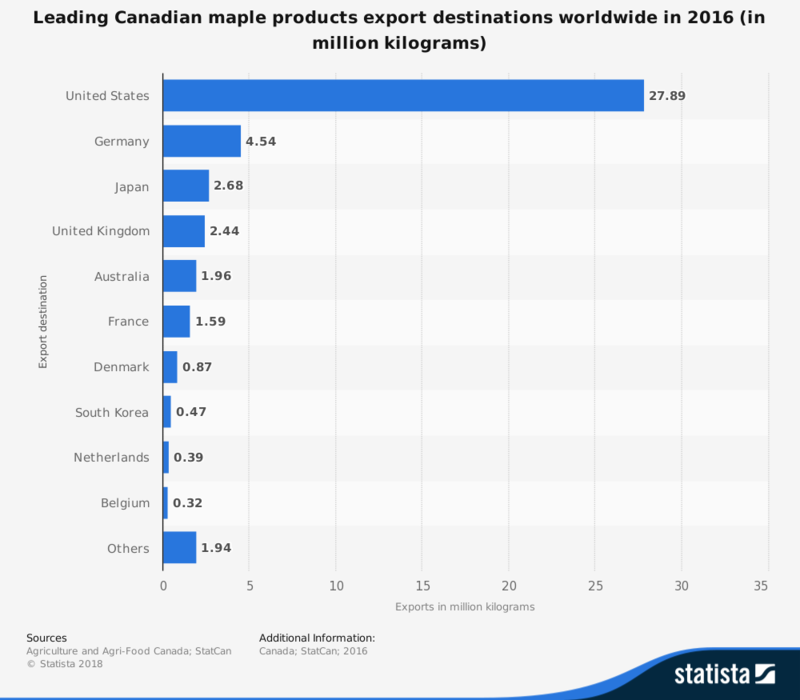 Canada has the perfect environmental conditions for producing maple syrup. When maple trees grow in cold climates, they store starch in their roots and trunks for the winter. As winter turns into spring, the starch is converted into sugar. Holes are then drilled into the tree to collect this sap, which is then processed through evaporation to create syrup. The process of collecting and refining maple syrup was started by the tribal cultures of Canada and the United States. As settlers came over, their techniques were learned and gradually refined. It wouldn’t be until the 1970s, however, that technological advances allowed the Canadian maple syrup industry to really take off. 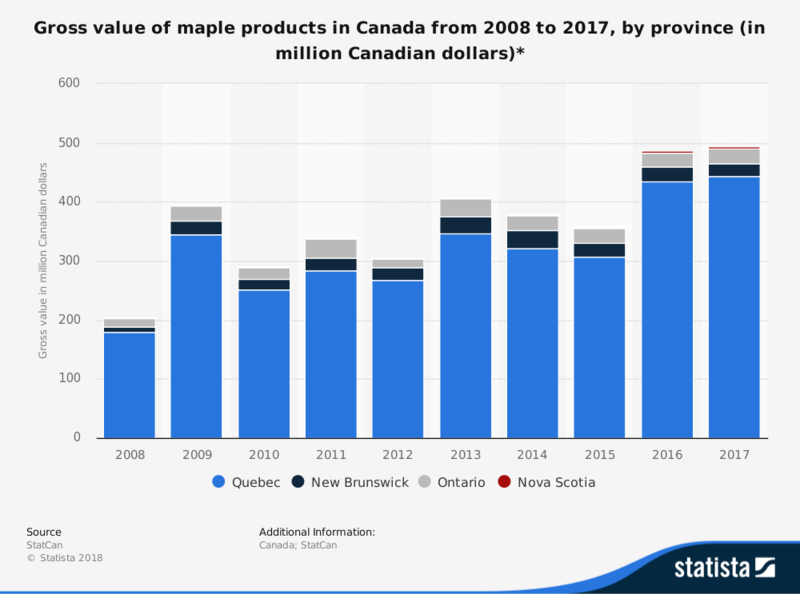 Measuring the total production values achieved by the Canadian maple industry is somewhat difficult. Various maple products are produced, including taffy, sugar, and various confections. These products are then calculated into a syrup weight in gallons, which makes converting total figures difficult. Exchange rates between the Canadian dollar, the U.S. dollar, and other currencies can alter the final value calculations achieved by the industry as well. 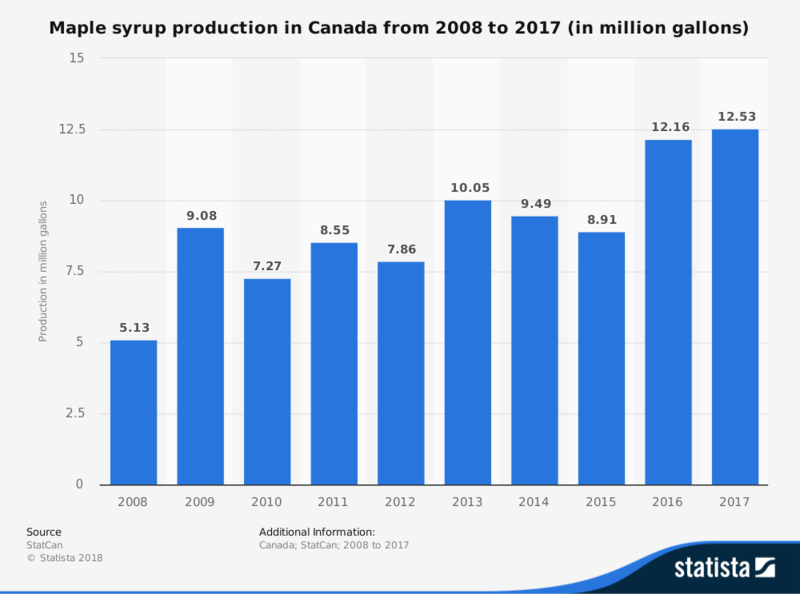 As the primary producer of maple syrup for the rest of the world, the Canadian industry is expected to thrive. The only issue of concern for the industry are potential changes in weather patterns. During unfavorable conditions, the industry saw unprecedented drops in total production value. Then, in 2016-2017, when favorable conditions returned, the industry was able to achieve a record harvest. Weather is not entirely predictable, which means the health of the industry is unpredictable. With so much of the industry based in Quebec as well, provincial issues will always provide a background threat to the industry as a whole.